This traditional Chinese calligraphy features the Chinese symbols for "freedom." This is also a.. This Asian scroll features the Chinese characters for "friendliness," also meaning "amicable," ..
Chinese character art portraying the virtue for "friendship." This makes an excellent and taste.. 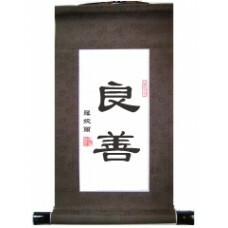 This Chinese calligraphy painting portrays the well-known symbols for "gentleness." 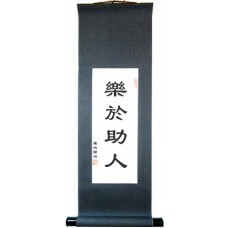 These chara..
Oriental wall scroll with the Chinese virtue "glowing spirit." This word is commonly used in Ch.. This Chinese virtue scroll features the characters for "goodness." Goodness is that quality whi.. This Chinese scroll painting features two characters. The first is "mei" and is the most popula.. The term "adoring love" normally refers to the love between a guy and a girl. This makes an excel..
Chinese wall scroll featuring the virtue "happiness." This is the most basic word in Chinese fo.. 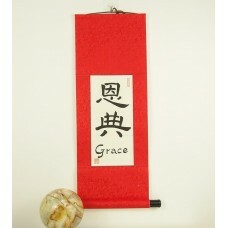 This double character Chinese wall scroll features the words for "harmony." This is esteemed Ch.. This Chinese scroll painting portrays the characters for "healthy lifestyle." This is esteemed .. This Chinese hanging scroll features four Chinese characters. They technically mean "happy to h.. This Chinese calligraphy wall scroll contains two characters, which mean "holy" or "holiness." ..